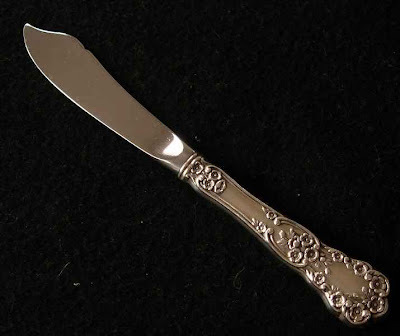 Silver Chatter: What's the Purpose of the Butter Knife Notch? What's the purpose of the notch in some master butter knives? Click on the picture below to see a larger version in which you can see the notch on the top of the blade better. We've posted this question in the hope that it will generate comments from readers to help enlighten us! The notch is an indicator that differentiates an individual diner's knife from the butter knife that sits next to the butter tray. You use the knife next to the tray to cut your share and your notched knife to spread. the blade portion of the Master butter knife ? This is a response to the last post regarding the notch. My answer is, "I don't know!" An earlier comment posted by anonymous source gave an interpretation but I can't verify the information.